In a large bowl, whisk together the flour, ginger, cinnamon and cloves until combined well. In a small bowl, stir together the molasses, water and canola oil. Pour the wet mixture into the flour. Stir ingredients until thoroughly combined. Use a gingerbread cookie cutter to cut cookies. Place your gingerbread man cookies on the baking sheet. Cool completely on a wire rack, or allow to cool in the oven (after you turn it off) for a crunchier treat. 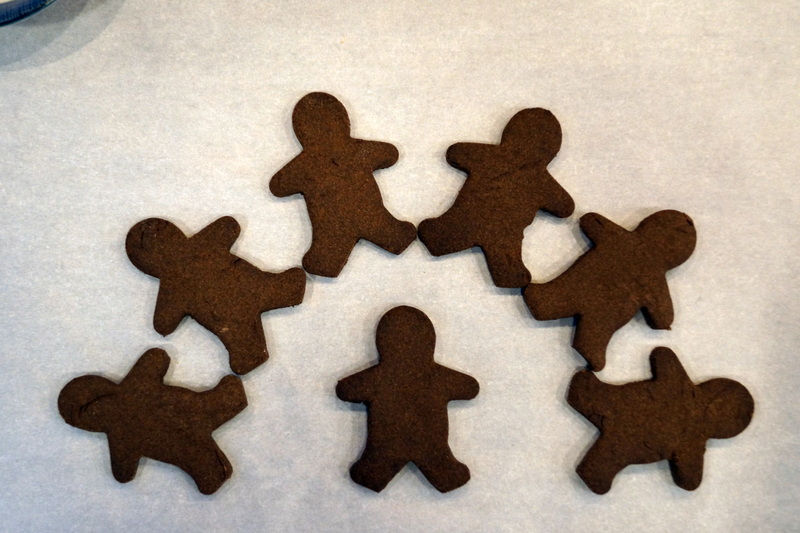 Yield – Will depend on size of your gingerbread man cookie cutter. My batch made 30 gingerbread man cookies. Storing – These treats should keep fresh for several weeks in the refrigerator, or in the freezer for approximately 6 months. This entry was posted in Cello's Cucina and tagged Blackstrap molasses, Buckwheat, Cello, Cello's Cucina, Christmas, Cookie, Cookie cutter, Dog biscuit, dog treat, Gingerbread man, home made, treat. Bookmark the permalink.